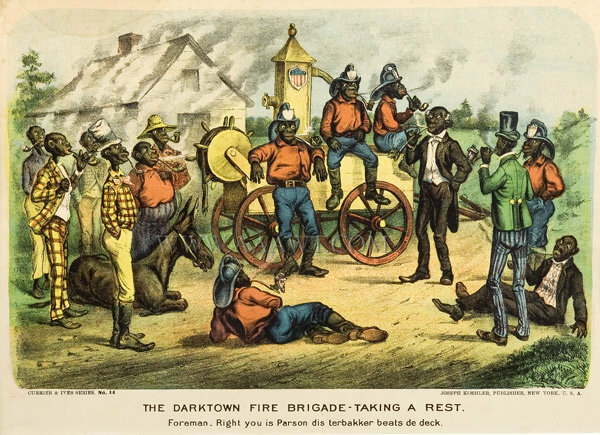 Seventeen actual portraits of posed firemen wearing parade uniforms; helmets and parade belts display “FC 10” [Forest City 10] proudly flanking a crane-neck style engine with tall dome air chamber. 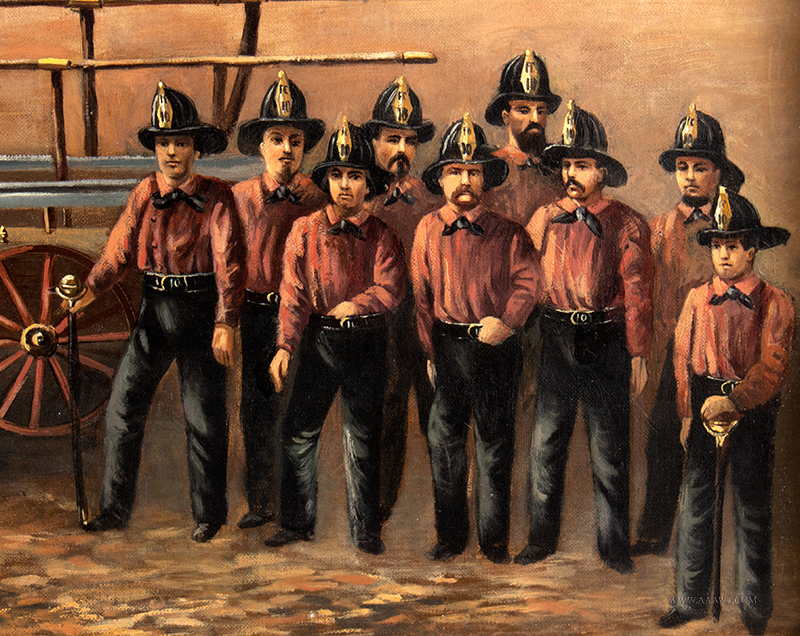 Torrent 10 was organized 1854 when Ohio City was annexed by the city of Cleveland See the History of the Cleveland Fire Dept 1857; in 1854 Forest 2 and Washington 1 were merged as part of the annexation of Ohio City by the Cleveland Fire Department becoming Torrent 10. 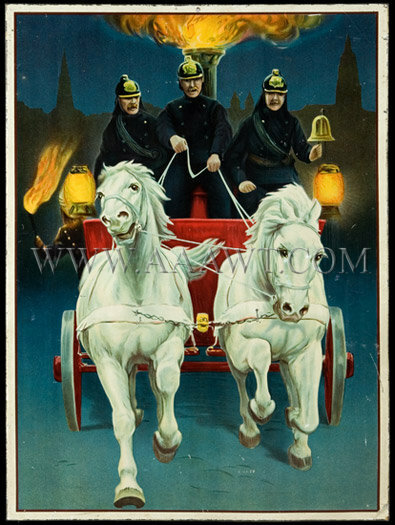 See the Encyclopedia of American Hand Fire Engines presented by Handtub Junction; page 91 for the only Torrent #10 listing. 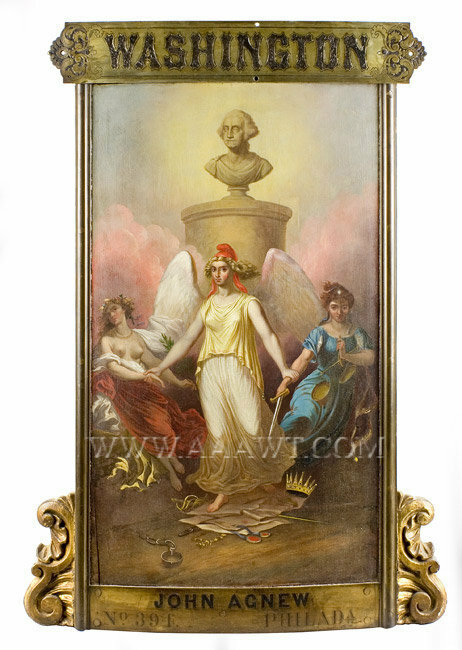 Reverse painted displaying Liberty holding shield showing a stag and polychrome flag with spread-winged eagle. The oak frame with gilt liner is original. 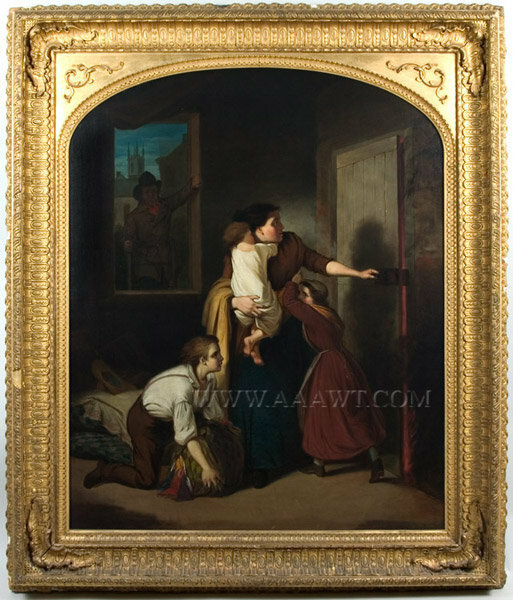 (Wear to varnish on frame, losses to gilt gesso on frame; Eglomise remains in excellent condition with minor lifting; frame: 35 by 27”, sight-size: 28 by 19.5”) Please call for full description, and/or enthusiastic discussion. 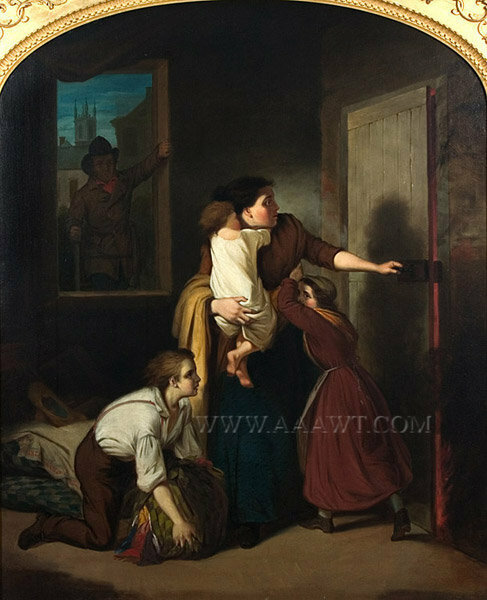 Oil on canvas, 36 by 46"
A large and dramatic picture-depicting a mother holding her baby with another young child holding her apron, she opens the door to see flames and smoke with helmeted fireman at the window about to rescue mother and children. 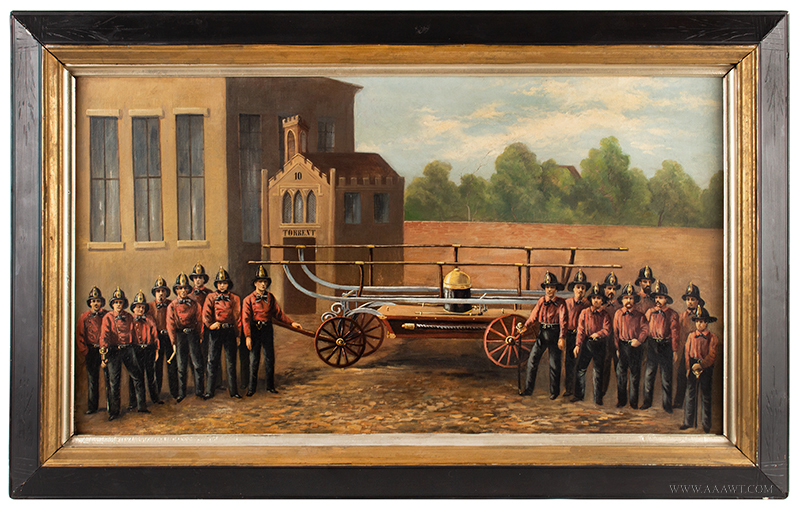 The work is mounted in a beautiful carved wood, gesso and gilt frame of the period and may have been commissioned for a chief or fire company whereas the artist is known to have painted portraits of several firemen. 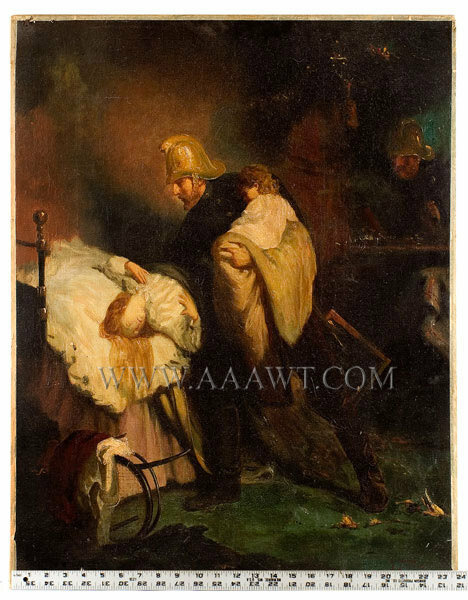 The dramatic scene depicting a fireman entering window while another holds a young child and rescues another from the smoke filled room. This painting memorializes the tragic fire of the five story building that claimed the lives of 12 firefighters July 10, 1893. 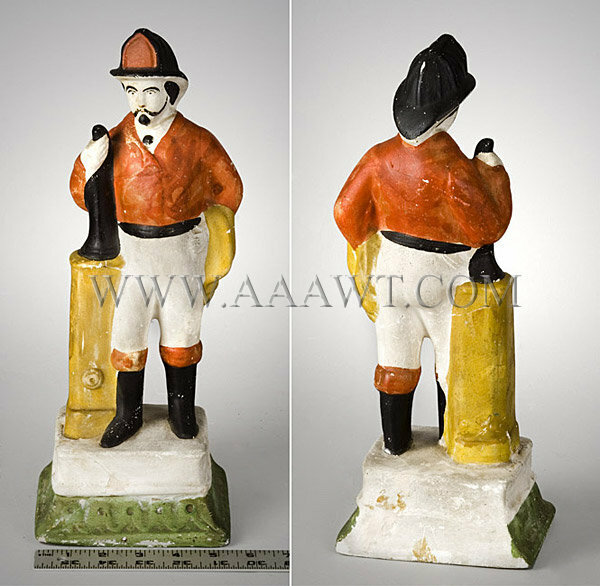 Working professional fire pumper model with hand painted name "Torrent", and painted date 1874 on both sides of the body. 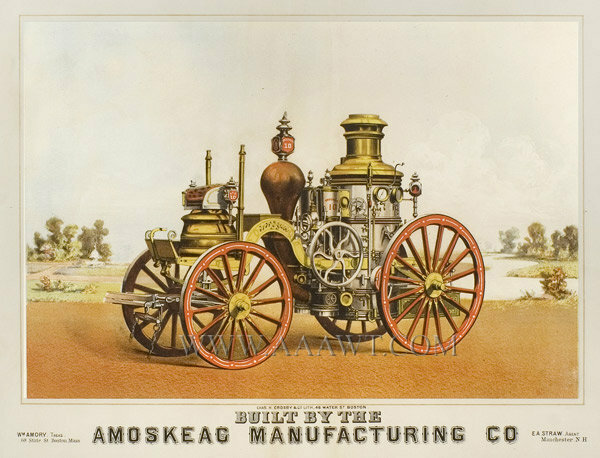 The front axle turns right and left; wheels are spoked; with brass hubs and wheel trim; brass wheel rings. The engine features a large brass pressure chamber and brass pistons; brass pumping arm cradles; small shaped removable brass pins on chains secure the pumping arms 9BRAKES) when underway. 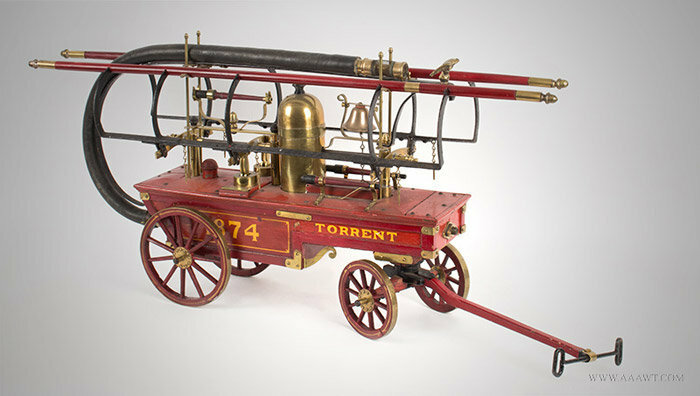 There are brass and iron cams that regulate the action of the pumper arms which are painted red and feature beautifully machined brass acorn finials. Ornamenting the apparatus is a cast brass eagle and a working brass bell within scrolled cradle. Stowed within brass fasteners, on the deck, and within the upper frame are three red and black painted wood and leather nozzles. Fitted to the tub is a large diameter squirrel tail suction hose with strainer having brass fittings. 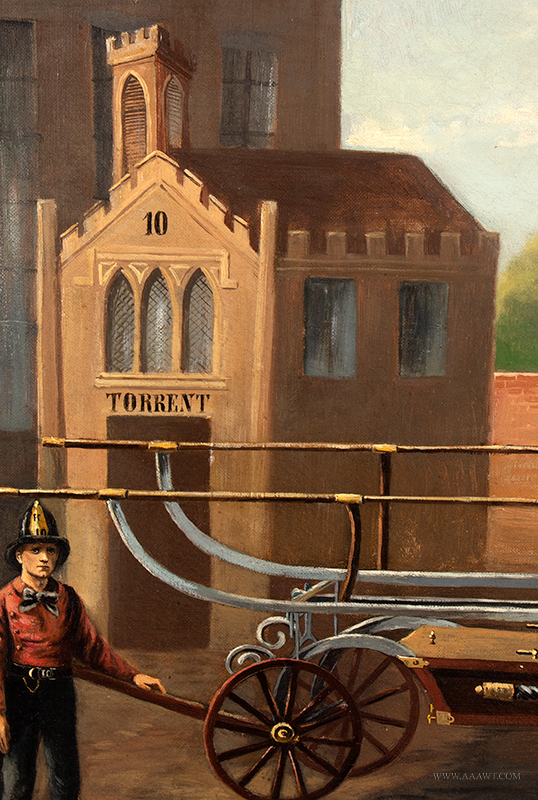 A partial embossed rubber label remains attached to the hose, it reads: "Prescott Seven Ply Storm King Boston"
A scene depicting an early hose cart with fireman in parade hat. 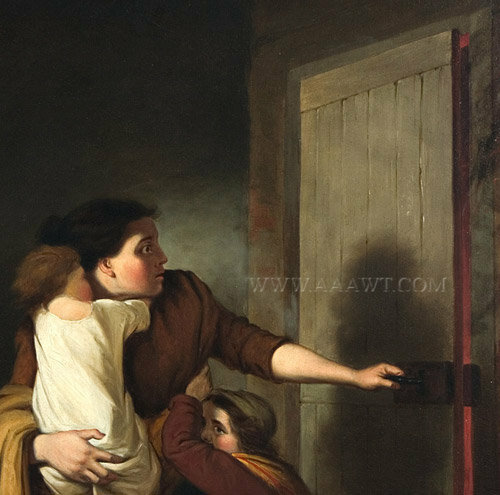 The work is mounted in a period painted frame and as depicted has stains. Frame: 19.75 by 16 inches; View: 15.5 by 11.5 inches. Simons and Fox, decorators specializing in awnings, tents, and flags, specializing in decorations for festivals, fairs, and halls; made parade decorations, Hartford, Connecticut. 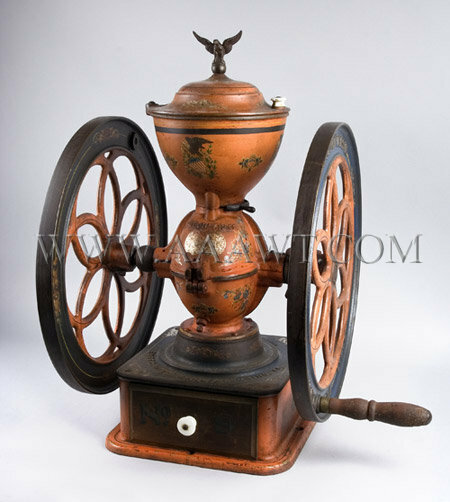 As depicted, a two-wheel No, 9 coffee mill remaining in original paint; wonderful eagle on shield festooned with leafy decoration, centered by ribbon recording manufacturer’s name and address. 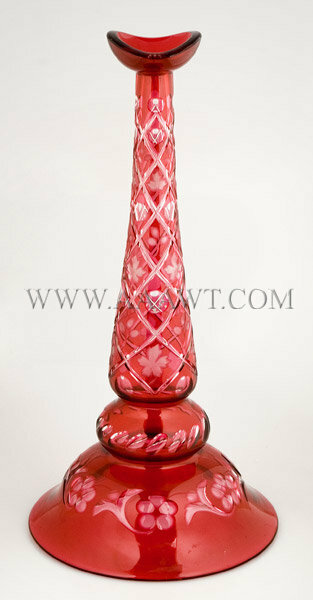 Dimensions: 27.5” high, 24” wide, 19.25” deep. 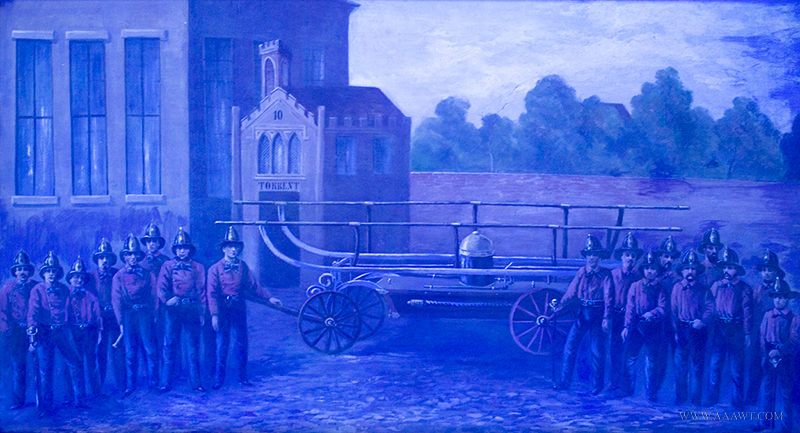 By the early 1820s volunteer fire companies had begun to paint their fire engines bright colors and commissioned artists to paint decorative panels for them. 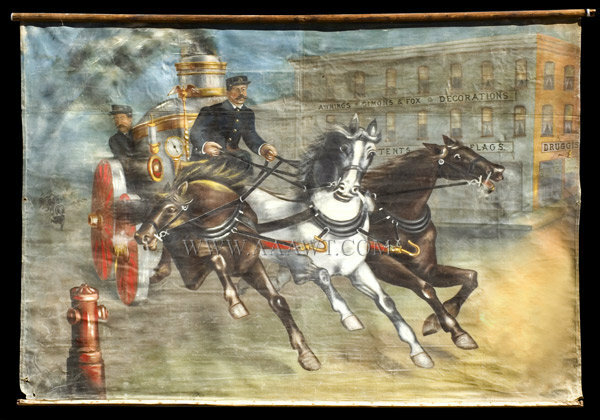 This panel, attributed to the prominent Philadelphia sign painter John Archibald Woodside, Sr., ornamented the Washington Engine Company's "Washington" fire engine, built by Joel Bates in 1832; rebuilt by John Agnew in 1838. Represented are outstanding allegorical figures of Freedom, Liberty, and Justice gathered at the base of a stone pedestal on which rests a bust of George Washington. 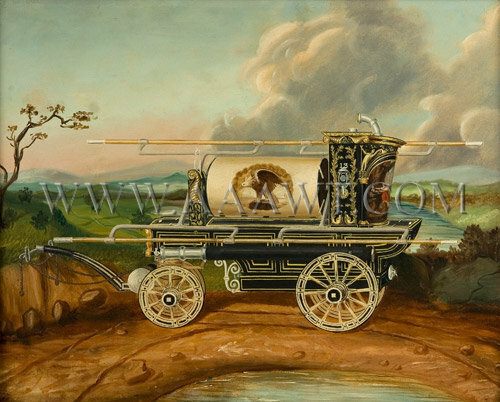 Woodside is documented as having executed commissions for the Washington Engine Company, and in 1832 he had made a preliminary sketch (now in the Historical Society of Pennsylvania at Philadelphia) as a design for a banner that is similar to this composition. 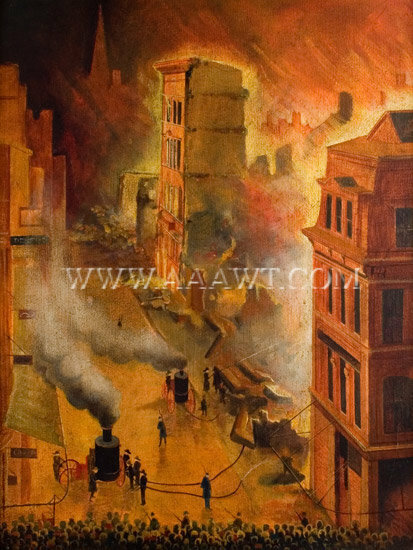 Scatted small losses and abrasions restored with all else fine; conservation and treatment report available. 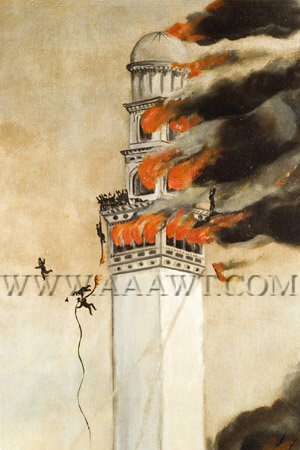 Little is known of the life and work of Jacob Baumann, Arthur Hopkin Gibson, in Artists of Early Michigan, A Biographical Dictionary of Artists Native to or Active In Michigan 1701-1900 (Detroit, Michigan, 1975) page 47, offers only scant information: Jacob Baumann was an amateur artist working in Detroit, who studied at the German-American Seminary in Detroit during the year 1875. His only other known work, depicting the old Tollgate at Gratoit and Mack Streets in Detroit is known from a photocopy in the Burton Historical Collection of the Detroit Public Library, mentioned in the Detroit News, July 26, 1925, The Metropolitan Section, Page 5. 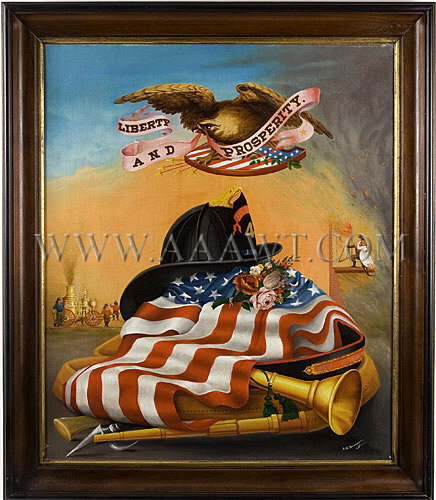 Literature: American Expressions of Liberty (Mingei International Museum, 1996) and will appear in American Visions of Freedom and Liberty (Virginia Historical Society.) 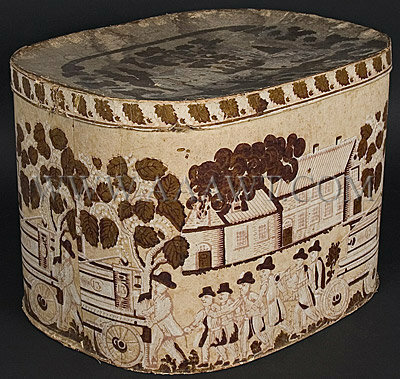 Also, The Billy Pearson Collection of American Folk Art, by David A. Schorsch. 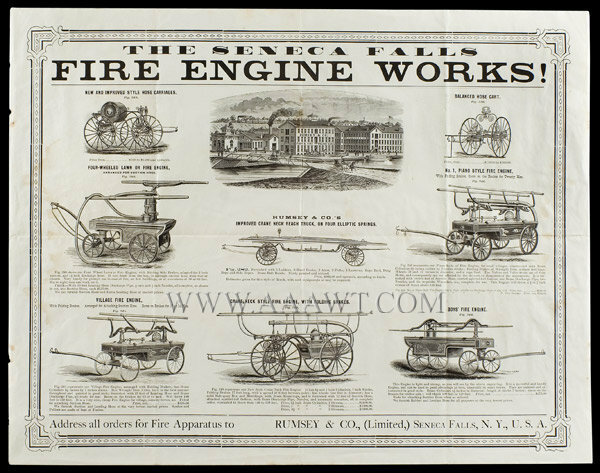 Broadside, Seneca Falls Fire Engine Works, Rumsey and Co. Excellent; folds as issued, faint water stain, all else fine. 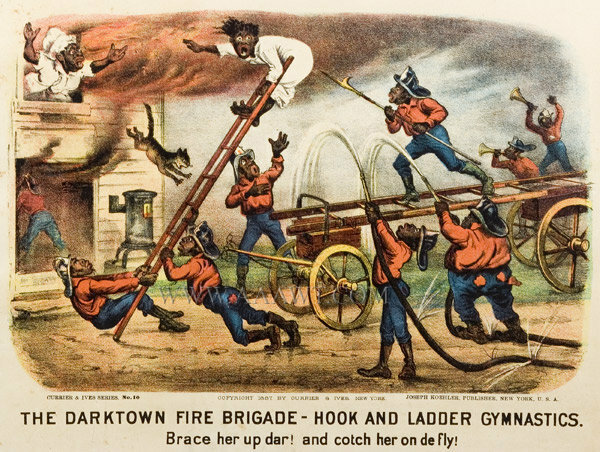 The caption reads, "Foreman - Right you is Parson dis terbakker beats de deck." Not examined out of frame; bright color. 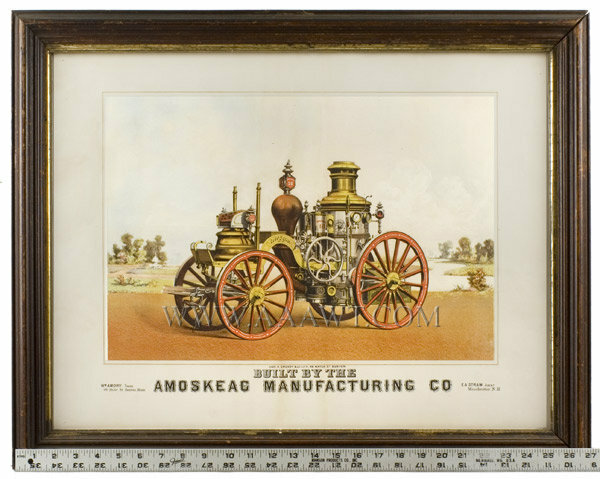 Dimensions: 21.5 by 17" frame, 10.25 by 14" sight-size. The caption reads, "Brace her up dar! And cotch her on de fly!" Not examined out of frame; minor foxing in margin at top right; tiny puncture in margin at bottom right, all else fine; bright color. The caption reads, "Now den! Shake her up once moah fur de Mug"
Not examined out of frame; minor creasing and tight tear in title line between K and T of DARKTOWN; all else fine; bright color. 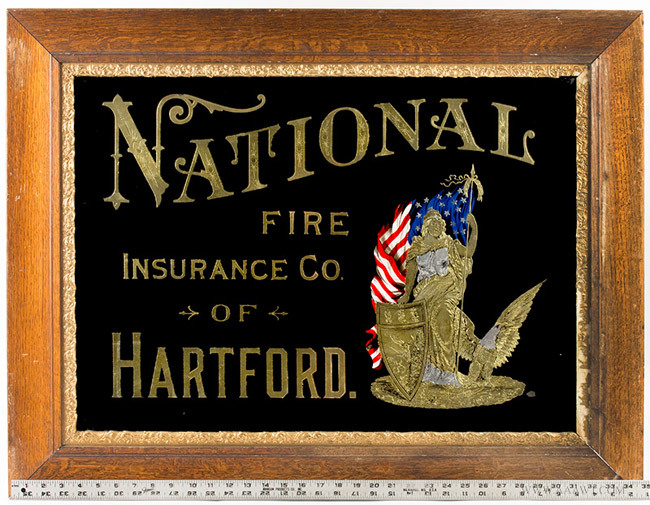 Framed painted tin sign in excellent condition. 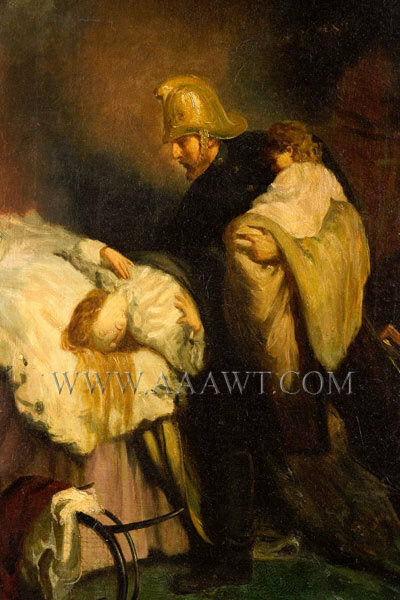 The work remains on original stretcher and is mounted with a gold gilt frame. 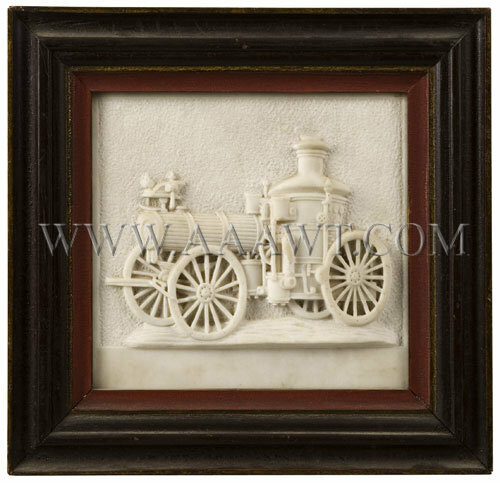 As depicted, a most unusual and successful work, perhaps created by a talented stone cutter who was also a member of a volunteer fire department. 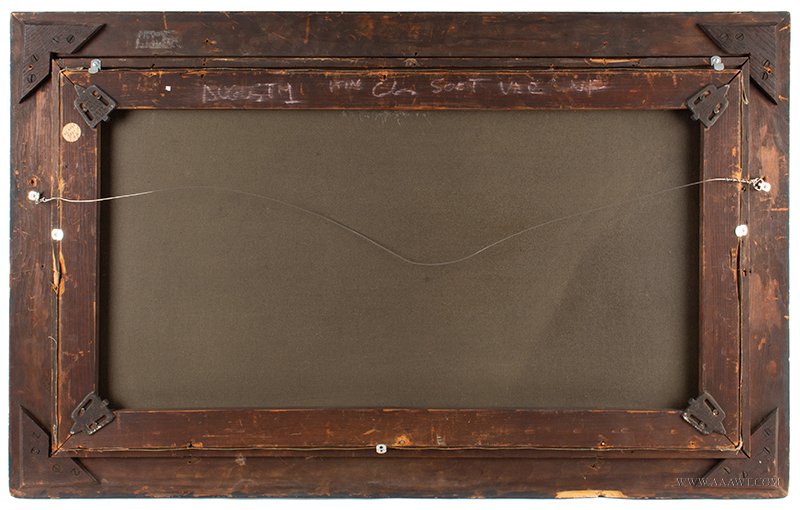 The work is mounted in a contemporary frame. 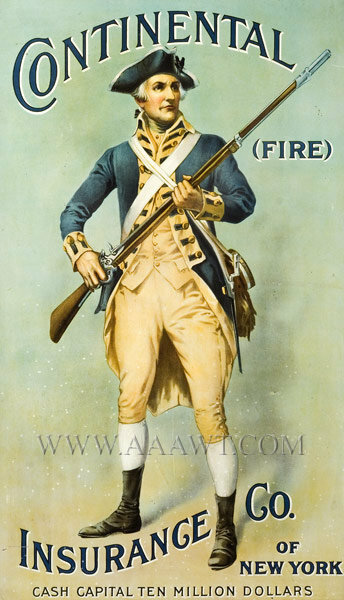 Dimensions: 11.25 by 11.75-inch frame, 7.5 by 7-inch sight-size. 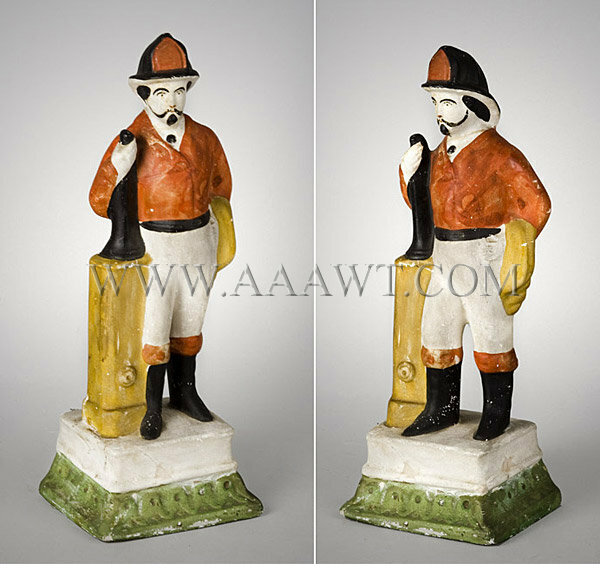 With folded edges and in fine condition with bright color. 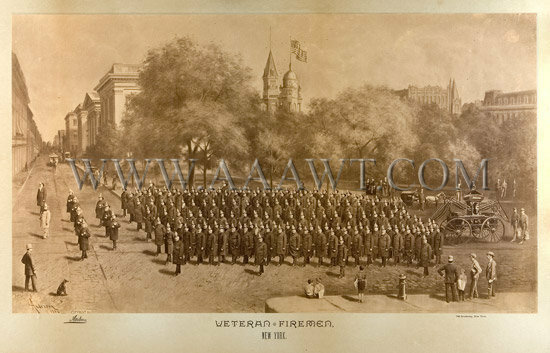 There were several noted VFA activities during 1886 with the largest assemblage of some 250 veteran fire fighter's being October 28th; the unveiling of The Statue of Liberty. 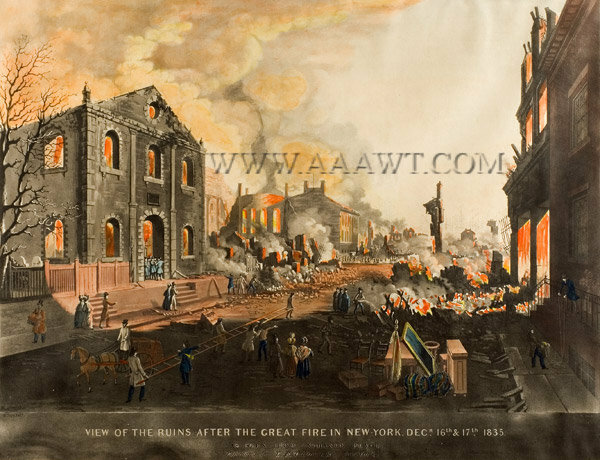 This large print (photo process) depicts a group portrait imposed on a realistic rendering of NYC. 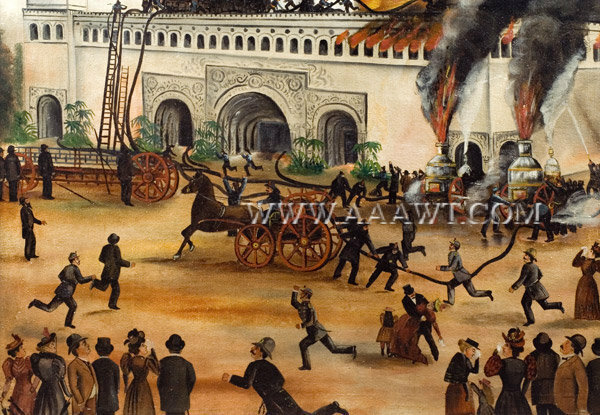 The work is mounted within an outstanding frame with applied composition firefighting motifs. 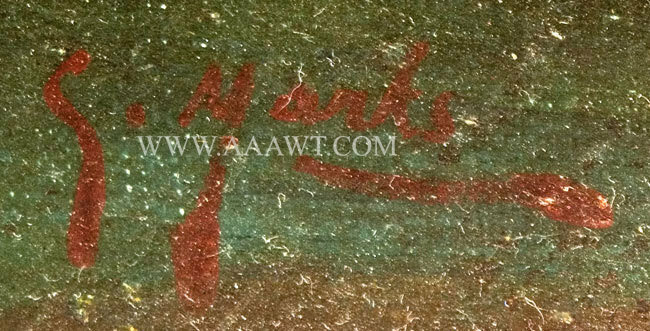 The piece was never opened since framing; upper corner helmets need restoration…as depicted, all else fine. 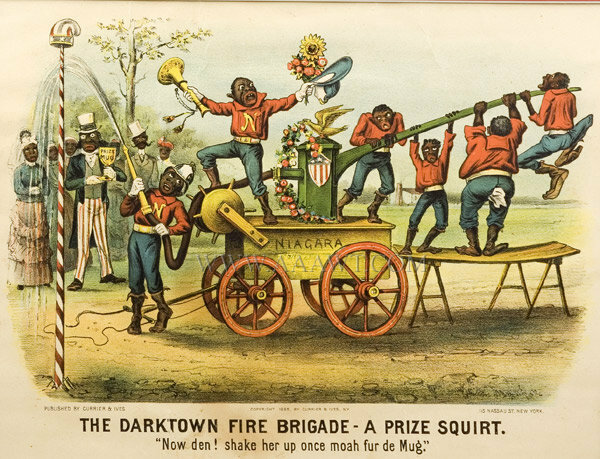 Please refer to Costello, The History Of The New York Fireman, page 763. 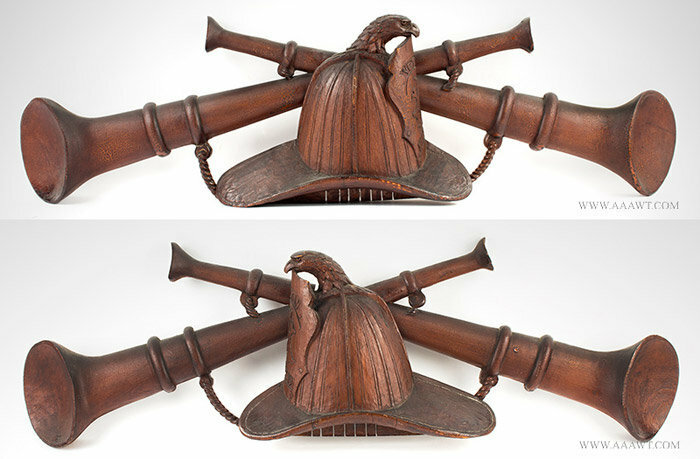 This unique wood presentation fire trumpet is approximately 55-inches long. 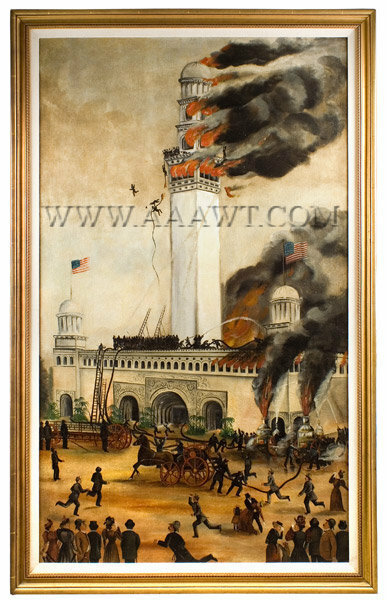 It has an inscription painted in black letters with red and gilt highlights that reads “Presented to / Washington S.F.E.H. & L. Co. No. 7 / Of Wilmington Del. 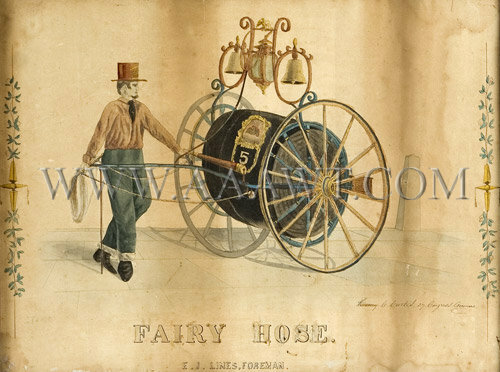 By / The Secret Eight Of / Washington H, & S, F, E, Co, No, 1 Of / Conshohocken PA. / Dec, 24, 1879.” The mouthpiece is detachable and there are two movable rings with black tasseled rope attached. 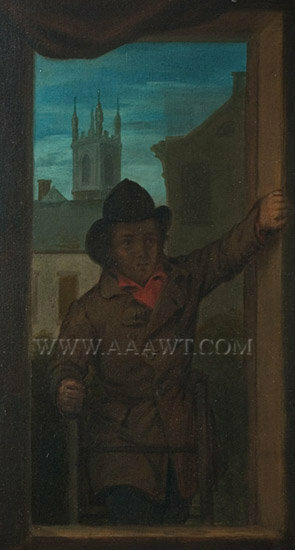 We are awaiting what the consignor states “is a considerable amount of paperwork” that will accompany the piece. 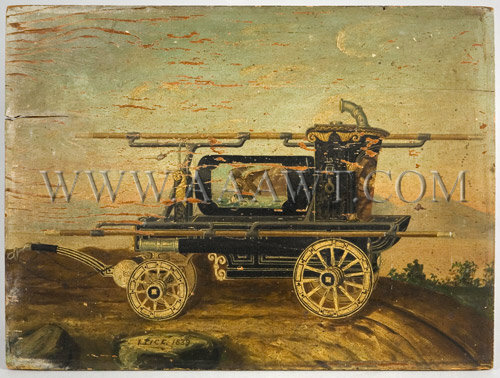 The picture is painted on clear white-wood; panel is chamfered on all sides. Extremely minor re-touch otherwise superb in all aspects. Frame: 23 by 19.5 inches; View: 17.75 by 14 inches. 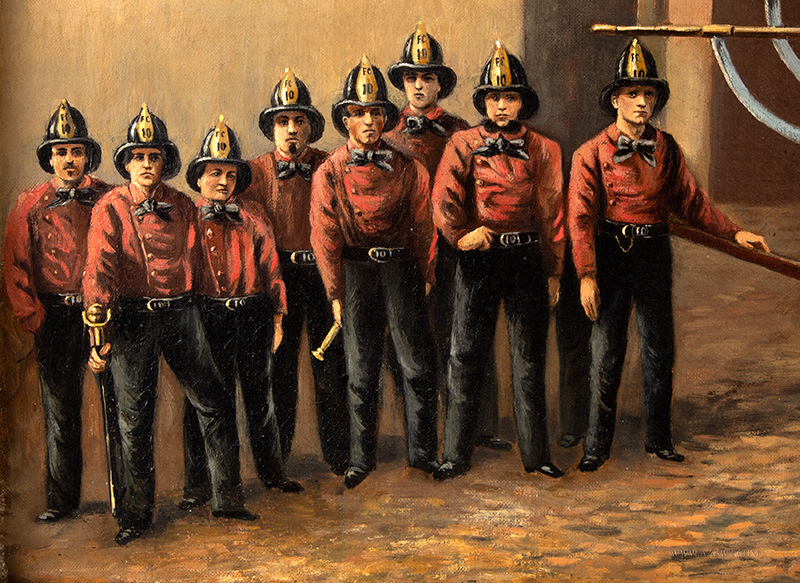 1 Our Fireman The History Of The New York Fire Departments From 1609 To 1887 by Augustine Costello, page 589. 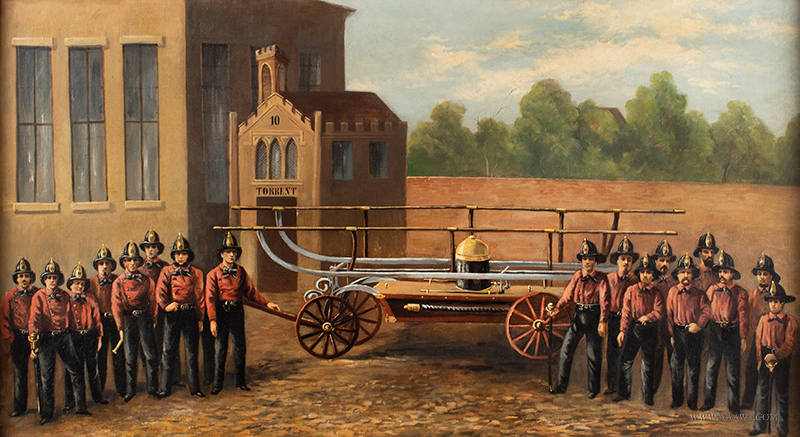 Oil on canvas portrait of an early 19th century firefighter, wearing Engine 32 badge and standing in front of gooseneck type engine with painted panel of the Seal of the City of New York, with his hat resting on the carriage, unsigned, relined with writing from original canvas copied onto lining "Property of / Harold V. Smith, Esq. 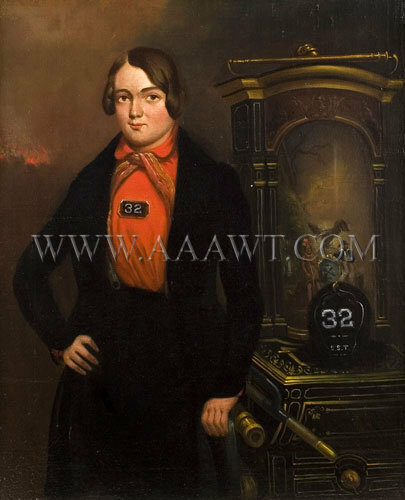 / My painting / [under this dated and signed by] / W. Effie / 1839." Fine condition. 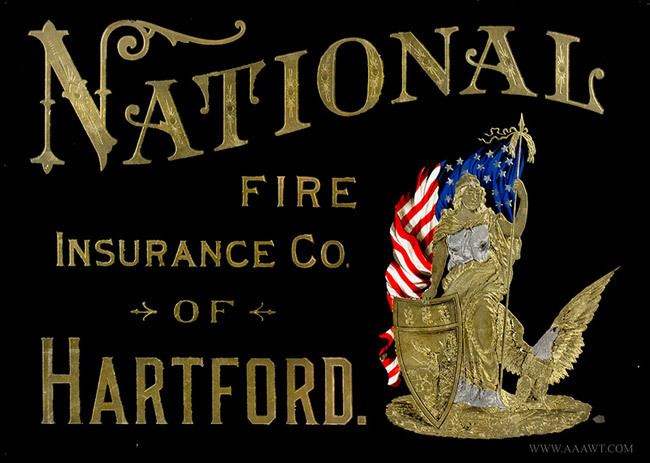 (Harold V. Smith, Esq., was the President of the Home Insurance Protection Company, and one of the - if not the - foremost collectors of fire memorabilia in America of his time. He also published or had published some of the most important references on the subject. Other information available.